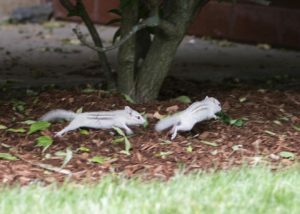 The chipmunk appears to be albino, but could be leucistic: They are all white except for light stripes on their backs. Their eyes appear to be red. Although many albino mammals are pure white, some retain partial coloring. Along with red eyes, albino animals have a near complete loss of pigmentation. Leucism may occur partially and sometimes in patches in mammals, birds and reptiles. An article in Missouri Conservation magazine explains the differences in an article on albinism. Albino animals have a complete lack of melanin, which creates normal colors. Leucistic animals may have all the traits of an albino, including all white skin, hair or scales, but have dark, rather than pink or red eyes and possibly color in their nails. In 2010 a leucistic partially white robin was seen in Athol. In November, a leucistic white squirrel was photographed in Hubbardston. “Leucism coloration can occur in individuals of any animal population – always fun to see when they show up,” said David H. Small, president of the Athol Bird and Nature Club. Albinism is also found in humans, with the most famous case that of musicians Johnny and Edgar Winter. The white chipmunks in Worcester are wary, but play well with ordinary chipmunks at the feeder, although Mr. Chappell said one of their cousins chased one away last week.